TORONTO – March 13, 2019 – Redline Communications (www.rdlcom.com) Group Inc. (TSX: RDL), the creator of powerful wide-area wireless networks for mission-critical applications in challenging locations, today announced operating results (in US dollars unless otherwise noted) for the fourth quarter and the year ended December 31, 2018. Revenue in the fourth quarter of 2018 was $7.5 million, up 14% over the third quarter of 2018, due to a large shipment to a major telecom service provider in Africa. Annual revenue for 2018 was $27.1 million, up 19% over 2017, due to increased activities in oil & gas and military sectors. Revenue for the fourth quarter of 2018 was down 9% over the same period in 2017, because a large offshore oil & gas deployment in Q4 2017 was not repeated in Q4 2018. “Redline ended 2018 showing revenue and bookings growth over last year. Healthy gross margins supported a profitable fourth quarter and a reduced net loss for the year as compared to 2017,” stated Robert Williams, Redline’s outgoing CEO. Order Bookings for the fourth quarter and year ended December 31, 2018 were $11.0 million and $33.1 million respectively, up 96% and 30% over the same periods in 2017. The increase in Order Bookings year over year came from all sectors, including oil & gas, military and telecom service providers. “We are seeing increasing demand from both new and existing clients across multiple vertical markets and in multiple geographies for both our traditional RDL-3000 product as well as our more recently introduced iLTETM product line which we continue to roll out,” added Mr. Williams. Overall gross margin for the fourth quarter and year ended December 31, 2018 was 55% and 52% respectively, as compared to 56% and 54% in the same periods in 2017, with the decrease largely attributed to ongoing industry challenges associated with shortages of some product components. Overall operating expenses for the fourth quarter and year ended December 31, 2018 were $4.1 million and $14.8 million, up 7% and 8% respectively over the same periods in 2017. The increase in operating expenses in the fourth quarter 2018 over the same period in 2017 was the result of severance costs and sales commissions. The increase in operating expenses in the twelve months ended December 31, 2018 was primarily a result of workforce additions in support of market expansion and higher commissions related to improved revenues. Adjusted EBITDA for the fourth quarter 2018 was $0.2 million, down $0.8 million over the Adjusted EBITDA of $1.0 million for the same period in 2017. 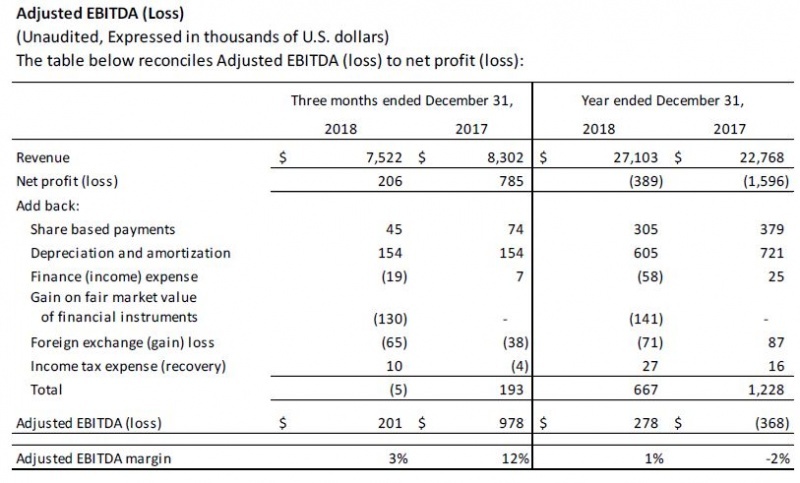 The adjusted EBITDA for the year ended December 31, 2018 was $0.3 million, an improvement of $0.6 million over the same period in 2017. Net Profit for the fourth quarter of 2018 was $0.2 million, or $0.01 per share, as compared to $0.8 million, or $0.05 per share, in the fourth quarter of 2017. 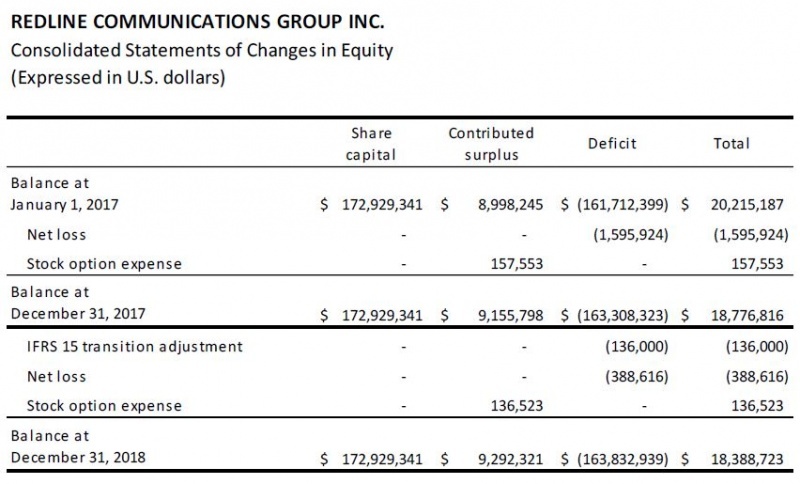 For the full year 2018, the Company reported a Net Loss of $0.4 million, or ($0.02) per share, as compared to a Net Loss of $1.6 million, or ($0.09) per share, in 2017. At December 31st, 2018, Redline held cash of $9.6 million, down $0.1 million from September 30, 2018, and down $2.3 million from December 31, 2017. “On behalf of the board of Redline and the entire company, I wish to thank Rob for his years of dedicated services and leadership. Rob has made a solid contribution as we evolved our business, especially during the oil and gas downturn as we reduced costs and right sized the business,” said Nizar J. Somji, Chairman. A conference call and webcast to discuss the results has been scheduled for Thursday, March 14, 2019 at 10:00 a.m. Eastern Time. To participate, please dial 1-647-427-7450 approximately 10 minutes before the conference call, and provide passcode 9976925. A recording of the call will be available through March 21, 2019 on Redline’s website or by dialing 1-416-849-0833 and entering the same passcode. Redline Communications (TSX:RDL) designs and manufactures powerful wide-area wireless networks for mission-critical applications in challenging locations. Redline networks are used by oil & gas companies onshore and offshore, mining companies on surface and underground operations, by municipalities to remotely monitor infrastructure, and by specialized telecom service providers to deliver premium services. Hundreds of businesses worldwide rely on Redline to engineer, plan and deliver ruggedized, secure and reliable networks for their IoT, voice, data, and video communications needs in locations that include the deserts of the Middle East, the rainforests of South America, and the frozen Alaskan slopes. For more information visit www.rdlcom.com. 1 To better assess the health and growth of the Redline’s business, the Company reports on non-IFRS metrics, including “Orders or Bookings”, “Shipped or Shipments”, “Backlog”, “EBITDA”, and “Adjusted EDITDA”. Further information including definitions of these measures and a reconciliation to their closest IFRS measures, if applicable, can be found in the Company’s Management Discussion and Analysis for the three and twelve months ended December 31, 2018 (“Q4 and 2018 Year MD&A”), copies of which are available on SEDAR at www.sedar.com. 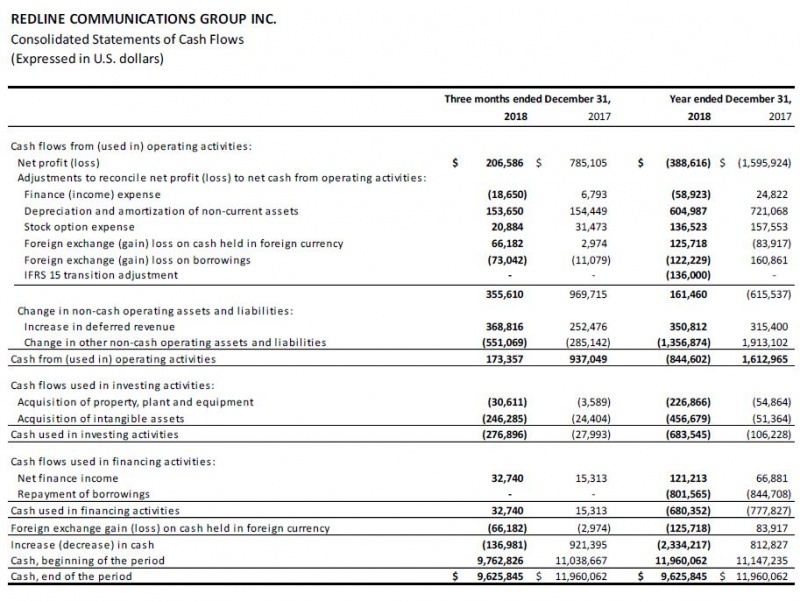 Further details on the three and twelve month results ended December 31, 2018 can be found in the consolidated annual statement of financial position, statement of comprehensive income (loss), statement of changes in equity and statement of cash flows reproduced at the end of this press release. 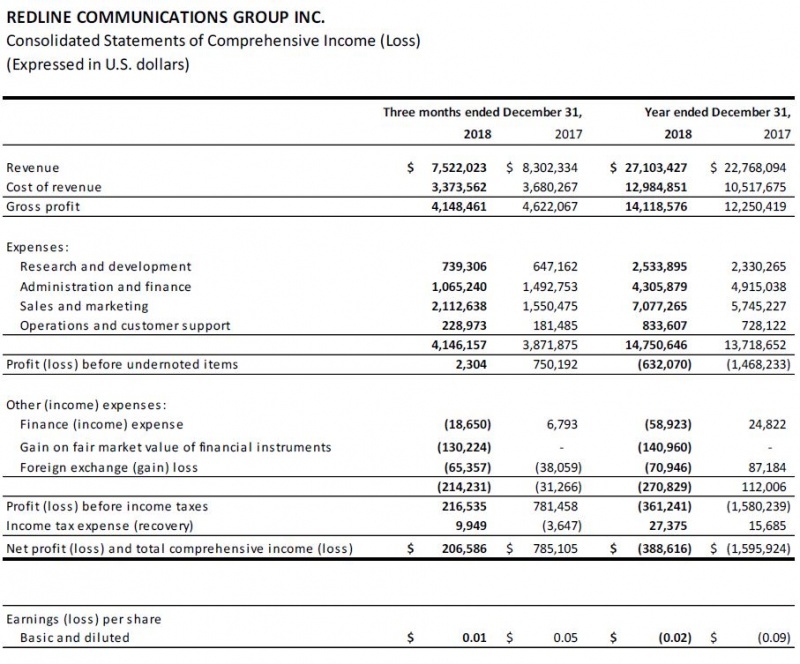 The selected financial information included in this release is qualified in its entirety by, and should be read together with the Consolidated Financial Statements of the Company for the year ended December 31, 2018 and the Q4 and 2018 Year MD&A. Certain statements in this release may constitute forward-looking statements or forward-looking information within the meaning of applicable securities laws. In some cases, forward-looking statements can be identified by terms such as “could”, “expect”, “may”, “will”, “anticipate”, “believe”, “intend”, “estimate”, “plan”, “potential”, “project” or other expressions concerning matters that are not historical facts. Readers are cautioned not to place undue reliance upon any such forward-looking statements. Such forward-looking statements are not promises or guarantees of future performance and involve both known and unknown risks and uncertainties that may cause the actual results, performance, achievements or developments of Redline to differ materially from the results, performance, achievements or developments expressed or implied by such forward-looking statements. Forward-looking statements, by their nature, are based on certain assumptions regarding expected growth, management’s current plans, estimates, projections, beliefs, opinions and business prospects and opportunities (collectively, the “Assumptions”). While the Company considers these Assumptions to be reasonable, based on the information currently available, they may prove to be incorrect. Many risks, uncertainties and other factors could cause the actual results of Redline to differ materially from the results, performance, achievements or developments expressed or implied by such forward-looking statements. These risks, uncertainties and other factors include but are not limited to the following: significant competition, competitive pricing practices, cautious capital spending by customers, industry consolidations, rapidly changing technologies, evolving industry standards, frequent new product introductions, short product life cycles and other trends and industry characteristics affecting the telecommunications industry; any material, adverse effects on Redline's performance if its expectations regarding market demand for particular products prove to be wrong; any negative developments associated with Redline's suppliers and contract manufacturing agreements including the Company's reliance on certain suppliers for key components; potential penalties, damages or cancelled customer contracts from failure to meet delivery and installation deadlines and any defects or errors in Redline's current or planned products; fluctuations in foreign currency exchange rates; potential higher operational and financial risks associated with Redline's efforts to expand internationally; a failure to protect Redline's intellectual property rights, or any adverse judgments or settlements arising out of disputes regarding intellectual property; changes in regulation of the wireless industry or other aspects of the industry; any failure to successfully operate or integrate strategic acquisitions, or failure to consummate or succeed with strategic alliances; and Redline's potentialinability to attract or retain the personnel necessary to achieve its business objectives or to maintain an effective risk management strategy (collectively, the "Risks"). For additional information on these Risks, see Redline's most recently filed Annual Information Form ("AIF") and Annual MD&A, which are available on SEDAR at www.sedar.com and on the Company's website at www.rdlcom.com. Redline assumes no obligation to update or revise any forward-looking statements or forward-looking information, whether as a result of new information, future events or otherwise, except as expressly required by law. All forward looking statements contained in this release are expressly qualified in their entirety by this cautionary statement.